together furrever: Who's Bribing Whom? Larry's brother Jamison started his freshman year at BYU a few weeks back. This also meant that we were fortunate to receive a visit from Larry's mom, who flew out to help Jamison get settled in for college. (Although we think the real reason for her visit was to spend time with her granddaughter—sorry Jamie!) Grandma Furr of course did her best to spoil Ava during her visit. 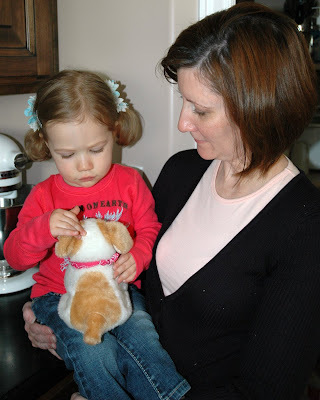 Here's Ava with Grandma Furr and a little mechanical puppy that made the trip out from Pennsylvania. The puppy barks, hops, kneels, does back flips, and drives us both crazy with all of its noise, but Ava is absolutely in love with it. 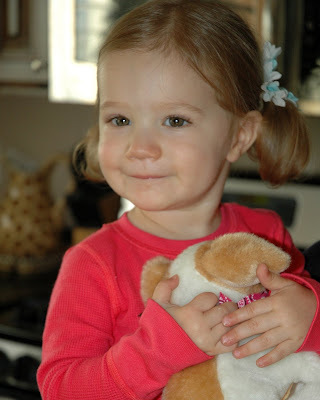 In fact, Ava couldn't stop hugging it the entire time Larry's mom was here, nor since she has left. 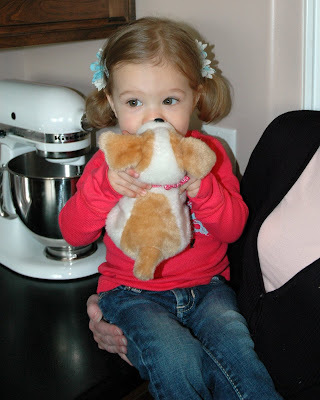 We think the puppy may get more hugs and kisses than mom and dad. 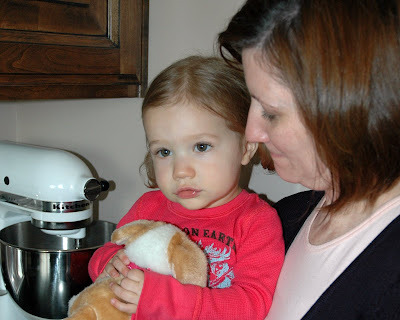 Realizing that she had hit a home run with the puppy, Grandma Furr asked Ava if she could have a hug, to which Ava happily agreed. 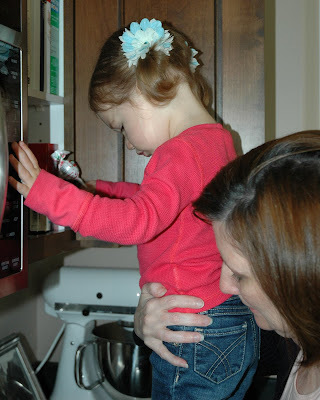 However, no sooner than Grandma Furr received her hug and kiss, Ava pointed at the cupboard. Grandma Furr took her over and Ava slyly grabbed herself a treat from off the shelf. So we ask you: who was bribing whom? Looks like she really likes that puppy!! She's getting so big...and cuter by the day!! We need to get together...seems like forever since we've seen you! !